With OCTOBER GOTHIC, many pleasant surprises were found when I shot with Infrared Black and White. One of the best images is the one left called SHE DREAMS IN INFRARED. The model's hair turns a lighter color in infrared. 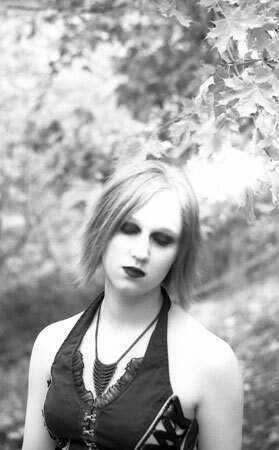 I would love to shoot future OCTOBER GOTHIC projects partially in infrared black and white. The look was acheived with a red filter over the lens and cutting the iso down. This site, all photos, and October GOTHIC are ©2009 David Blackwell. All Rights Reserved.